Area residents had their first look at the interior of the new Cardinal Inn Motel and Event Center in Albion during an open house last Saturday, May 3. Visitors liked what they saw, based on many positive comments made throughout the day. 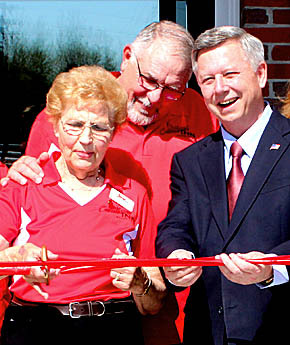 During a ribbon cutting ceremony Saturday afternoon, Gov. Dave Heineman saluted owners Randy Christo and his mother, Jackie, on their vision for the future of the community and area in building this new facility. More than 800 visitors attended the open house throughout the day. Read more in the May 7 Albion News Print & E-Editions.